In a large non stick skillet. heat one teaspoon olive oil over mdium heat and add the quartered blood oranges. Add the minced garlic and thyme and cook for about 3 minutes. Add the blood orange juice, cover and cook over medium - low heat another 5 minutes. Uncover and spoon the content of the skillet into a bowl. Reserve. In the same skillet, heat up the remaining olive oil and the butter over medium high heat. Add the lamb chops and cook for about 5 minutes on each side (for medium rare). Season with salt and pepper and add the remaining thyme. Divide the lamb chops among four plates. Let them rest while you reheat quickly the blood orange sauce. In the same skillet, over medium high heat, pour the reserved blood oranges and sauce and reheat briefly. Pour over the lamb chops. Time to eat! Roasted Okra With Chili Oil, slightly adapted from Southern Comfort. Cut the okra pod in half lengthwise. 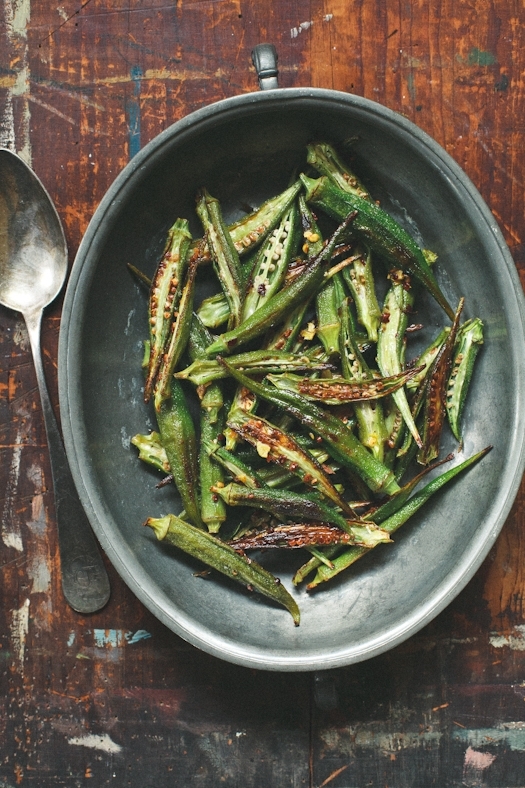 In a large bowl, toss together the okra, salt, pepper and chili oil. Spread the okra in a single layer on a baking sheet and roast for about 15 minutes or until brown. Serve immediately. In a small saucepan, combine the garlic, red pepper flakes and oil. Bring the oil to a low bubble over medium low heat. Cook for about 5 minutes. Remove from the heat and let cool. At this point, you can decide to strain the oil or keep it as it is. I keep mine as is in a small jar in a dark place, away from other heat sources so it stays fresh. We have got some okra in the fridge! So gonna make them your way! Thanks for sharing the recipe! I just tried my first blood orange a few days ago and I'm still tasting it! 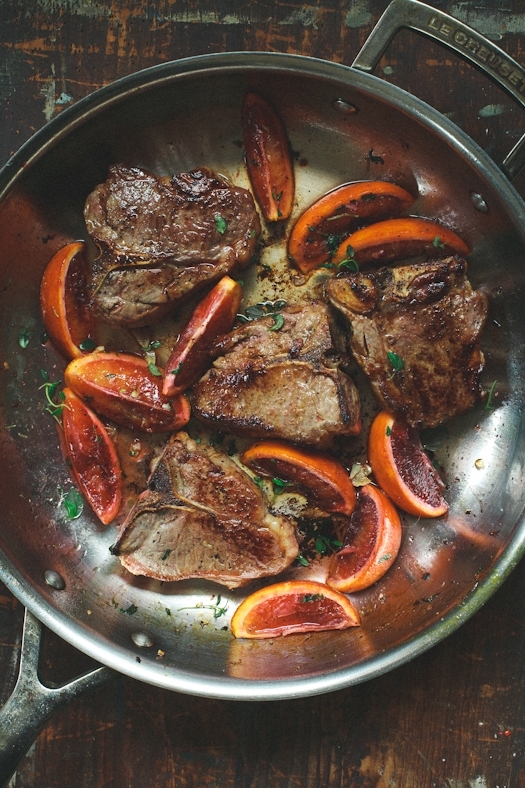 Love the idea of using blood orange wedges while cooking the lamb! Brilliant way to add juice and zest. Is okra kind of a sweet pepper? It's funny how sayings are true huh? Absence does make the heart grow fonder. It's nice to miss the other person once in a while and crave those little moments that you have together. wonderful pics Helene, as usual :-) You're always source of inspiration! Wow! The first thing I do, whenever I visit your blog is admire the pictures and then I worry about recipes!!! Your pictures are beautiful as always! Miam, looks devine. I never made Okra this way. I always make it in a stew. Will try your recipe. Love love lamb chops. I am sure they were delicious. Great pics as always. Thanks for sharing. Such a sweet post Helene.. Your whole v day scene just scrolled past my eyes..
Okras look so damn scrumptious! Oh my gosh the roasted okra sounds delicious! I've never seen it cooked like that. You always make simple look so elegant! 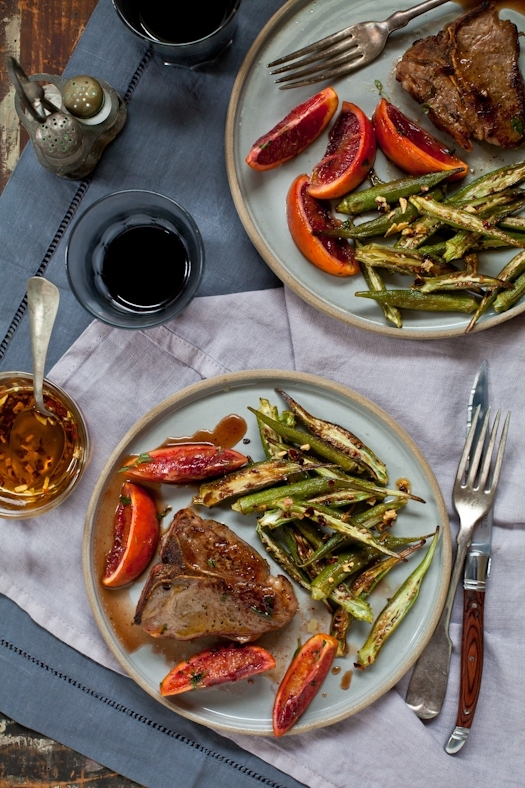 Lovely staging, lovely dish, lovely post! Beautiful as usual Helene! I cannot stop learning from you! Oh not only does it look delicious but those colors in that final image- especially GORGEOUS!!! wonderful and beautiful pics....well done!!!! Makes hungry and encourages to try your receipts! How romantic! And that lamb chop on the last photo does resemble the shape of heart (look around it's bone). Those look divine. I've never thought bout combining blood oranges with lamb before...but perhaps that because I'm too consumed with transforming the few blood oranges that come my way into lemon curd! I can't wait to figure out a way to adapt this recipe to the grill. What a great combination of flavors. Another great recipe! Wowwww como me gustan estas fotos y la receta. Simple pero deliciosa. i love okra! your okra looks amazing--none of that "slime" that usually appears when you cut it. This may just end up being my Saturday night meal! Sweet story and awesome meal!! 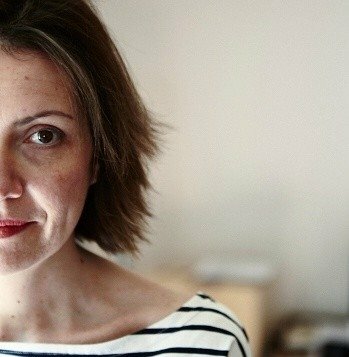 This is my first time leaving a comment here, but I'm always fascinated by your recipes and gorgeous photography... 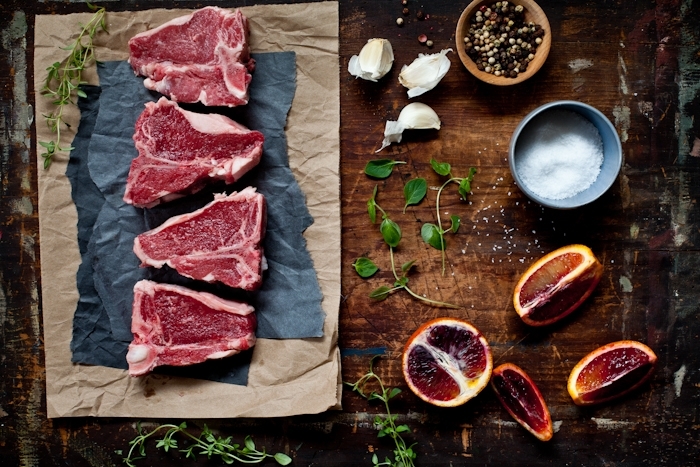 I call myself a "flexitarian", vegetarian mostly, but once in a while, I can't resist the temptation of a meal like your lamb chops... Must make!! Such a beautiful post. Hang in there with the distance and the settling down in Birmingham! Gorgeous use of reds and pinks in honor of Valentine's Day! I saw your book 'Plate to Pixel' at Librairie Gourmande in Paris yesterday. I am off to buy it tomorrow. l look forward to buying all the cookbooks you work on. Your lighting, colour management, composition and styling all come together to create superb photos. Nothing is lacking. I await the details of your photography and styling workshop in Ireland. Love your blog. Oh to be so skilled that you can make okra look tasty! To die for - some of my favourite ingredients all rolled into one recipe. Got my hands on some Sicilian blood oranges which I found at a local hotel that was hosting a guest chef from Italy. May switch the oregano with rosemary. Long distance relationship is something I am also very familiar with -- the only difference is that, the Husband is the one that travels so frequently. Love okra and how its roasted so simply. Yum! What a beautiful meal, and a lovely post. Best of luck to you and your husband. 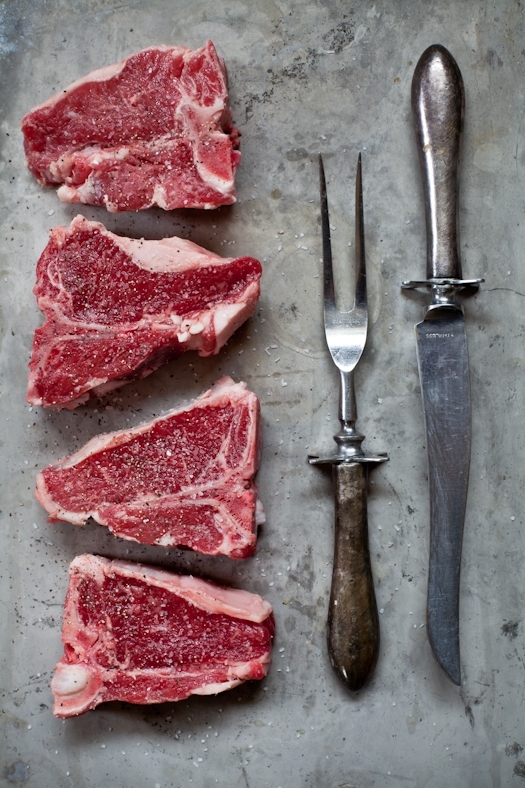 Is there anyway you can tell me what brand your carving set is in the photo with the raw chops? It is absolutely beautiful and exactly what I am looking for! Thank you so much. Keep up the amazing work! Beautiful meal and sentiment. As always an inspiration. I should have known this was your recipe just based on the familiarity of your photography! I made this last night with venison chops. What a strikingly beautiful presentation, and lovely flavors. I couldnt find okra but I followed your lead on a spicy side dish and did a simple 5-spice roasted acorn squash. A great pairing. Thanks! p.s every time I get together with my friends they tell me how much the food photography on my blog has improved. I haven't even finished reading Plate to Pixel and my photos are much better! oh my, Helene! This looks too beautiful to eat! As always, your recipes and photos are so inspiring! Oh Helene, this was AH-mazing! It was super simple, yet made me feel like I was at the best restaurant in town! I had to post about my experience making it, but I totally linked back to you a few times over! Thank you so much for the flavorful recipe! Salut!